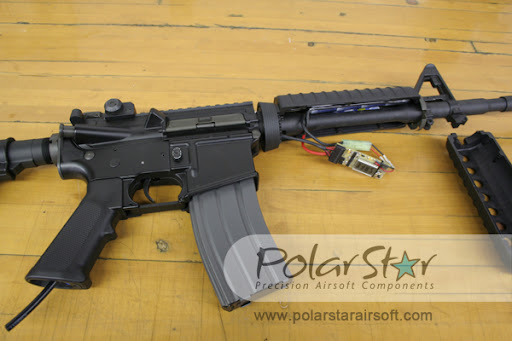 Pyramyd Airsoft Blog: Revolutionary new Airsoft Rifles from PolarStar Airsoft are almost here!!! 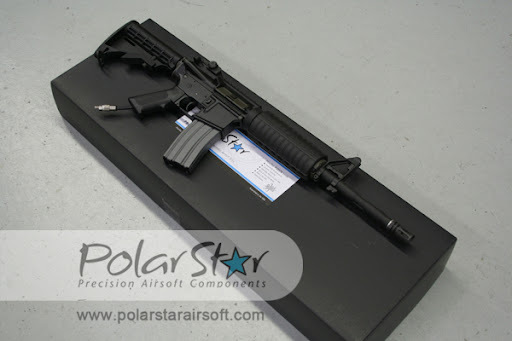 Revolutionary new Airsoft Rifles from PolarStar Airsoft are almost here!!! Not only will PolarStar be offering Airsoft rifles with their HPA Solenoid Engine pre-installed, they will be allowing the engines to be sold separately as drop-in kits for those that already have an AEG body to drop one into. Below, you can see the custom electronic control system hangin' out. You might not be able to see in the image, but there is an actual joystick/button thingy that allows the user to adjust the rate of fire up or down. 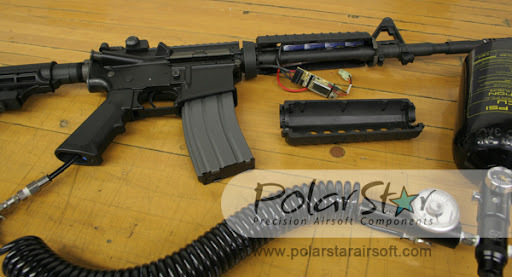 The new PolarStar system does require a small battery to power the electronics, but as you can see in the photo, it's probably going to come set up with a tamiya connector to allow users to simply connect their existing AEG battery packs to power the system. The High Pressure Air (HPA) rig is your basic paintball-style tank with a quality stabilizer like one made by Palmer's Pursuit, and a remote coil, which is basically what I call an air hose. It probably wouldn't hurt to add a little pressure gauge to your air tank while you're at it, assuming one doesn't already come with your tank. Also, don't bother with C02. PolarStar knows what they're doing and they recommend HPA. It's better, especially for you cold-weather kids. Google it. I also realize that some would argue that this isn't really a new system because it's fairly similar to the so-called "Classic" Airsoft guns that run on HPA as well. However, I am pretty sure PolarStar has made a few improvements to the engine design since the birth of the Classic guns a few decades ago, so try to keep an open mind before you simply write this off. It's not too often we have a U.S.-based Airsoft manufacturer trying to put out an affordable, super high-performance system that alleviates many of the problems that plague current AEG platforms. 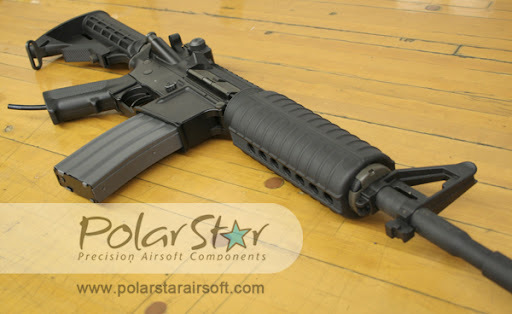 Release date for the PolarStar Rifles and Drop-In Kits should be around mid to late March. Yes. You read that correctly. 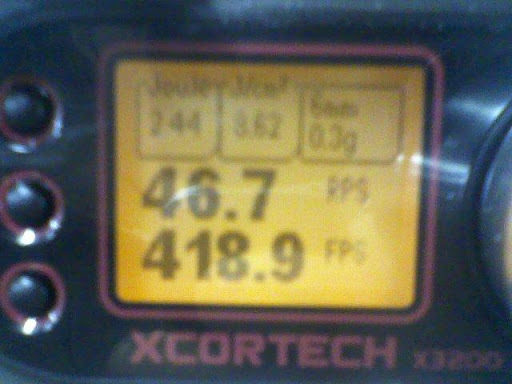 That chrono says 46.7 Rounds Per Second at 418.9 FPS with a .30g BB (2.44 Joules)!!! That's the equivalent of about 513 FPS with a .20g BB. Now, before you self-appointed safety-enforcers hit the panic button here, Ben and/or PolarStar is not suggesting one runs their rifle at that speed on full-auto. He was simply demonstrating a small taste of his brilliant new system's capabilities. Truth be told, higher ROF's are achievable with the PolarStar HPA engine, however, one will be limited by the strength of the feeder spring in your AEG Magazines. There are some that just won't be able to keep up. What a freaking phenomenal problem to have!!! Special thanks to PolarStar for sharing this very exciting news with us.